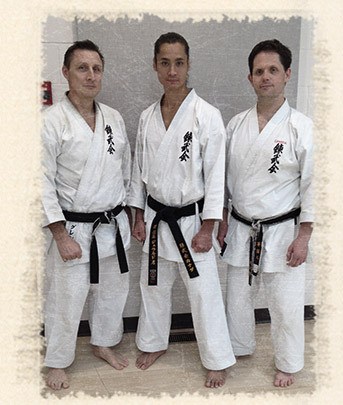 Kōkkikan Dōjō is proud to offer quality instruction in Renbukai karate following a lineage of inspirational teachers from both Canada and Japan, adept in the art of karatedō. Kōkkikan Dōjō is a registered dōjō with the All Japan Karatedō Federation (JKF) Renbukai. 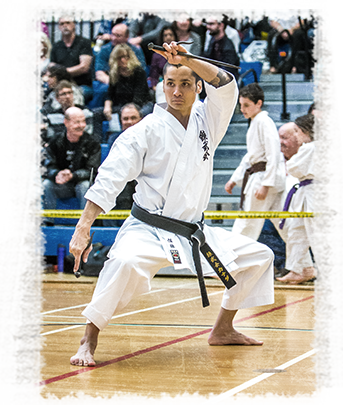 Jared Sato Sensei began practicing Renbukai Karate in 2003, and achieved shodan in 2011 under the careful tutelage of his teachers Glen Smith Sensei and Rob Kirik Sensei from the Kantō Shō Karate Club in Calgary, Alberta. He currently holds the rank of sandan (3rd degree black belt), registered with the All Japan Karatedō Federation (JKF) Renbukai, as well as nidan (2nd degree black belt) as a practitioner of Ryūkū Kobudō Tesshinkan (traditional Okinawan weapons system). 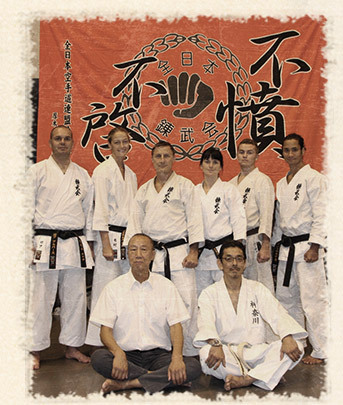 Jared Sato Sensei maintains connection with Kikumura Sensei of the Atsugi Branch in Kanagawa, Japan, and has travelled to Japan to train and compete at the All Japan Full Contact (Bōgu) Karate Tournament Renbukai. I began practicing martial arts at a very early age in 1985. Throughout the years I explored different disciplines and styles of martial arts including: jūdō, Chitō-ryū karate, jūjutsu, hapkido, Shōtōkan karate, and Muay Thai kickboxing. It wasn’t until 2003 that I came across Renbukai karate, and since then I have never looked back. I value both the traditional and practical aspects of the practice, and I believe Renbukai to be an ideal blend of these 2 elements. I believe strongly in the “dō” (“path” or “way”) aspect of karatedō, and that with dedication and consistency, karate can positively influence many aspects of the practitioner’s everyday life. I am passionate about the practice and teaching of this martial art. I strive to encourage, educate and empower my students through karate, and to foster a learning environment where improving character, mental/spiritual development, and physical health are all considered. Ultimately, I see myself as a guide, with the goal of helping my students realize their true potential so they may progress and grow as both everyday people and karateka. Also a certified personal trainer and yoga instructor, I have a deep understanding of human anatomy and body mechanics, which complements my instruction and enhances my student’s experience. I look forward to teaching any and all who are interested in learning traditional karatedō and Renbukai karate. I will always be grateful for the thorough and expert guidance I received from my teachers and fellow karateka from the Kantō Shō Karate Club and Japan. Please contact us anytime if you would like to tour our dōjō, meet an instructor, or to schedule your free karate classes to give us a try!